Palette includes an array of striking shades: Light Pink, Beach Berry, Yellow, Black, White, Dark Blue, Teal, and Violet! Re-use the jewels with Mehron’s AdGem adhesive. You can never have enough glitter! @twistinbangz uses Mehron's brand new collab Halloween Palette with The Gypsy Shrine to transform into a metallic glitter queen Music by BENSOUND http://www.bensound.com/royalty-free-... Creative Commons — Attribution 3.0 Unported— CC BY 3.0 http://creativecommons.org/licenses/b... Music promoted by Audio Library https://youtu.be/gnvwBNvVfuU ––– • F.A.Q: How to use music https://goo.gl/zNKFGu ––– • Main Playlists: Artists: https://www.youtube.com/channel/UCht8... Genres: https://www.youtube.com/channel/UCht8... Moods: https://www.youtube.com/channel/UCht8... ––– • Follow us: Facebook https://goo.gl/BBxPNx Twitter https://goo.gl/WJnMWV Instagram https://goo.gl/5EgBhP SoundCloud https://goo.gl/KfElaU Google+ https://goo.gl/eDXHbT ––– * IMPORTANT * This channel does not have any kind of relationship or association with the YouTube brand and its products. It does not represent their interests, nor have any connection with their activities. 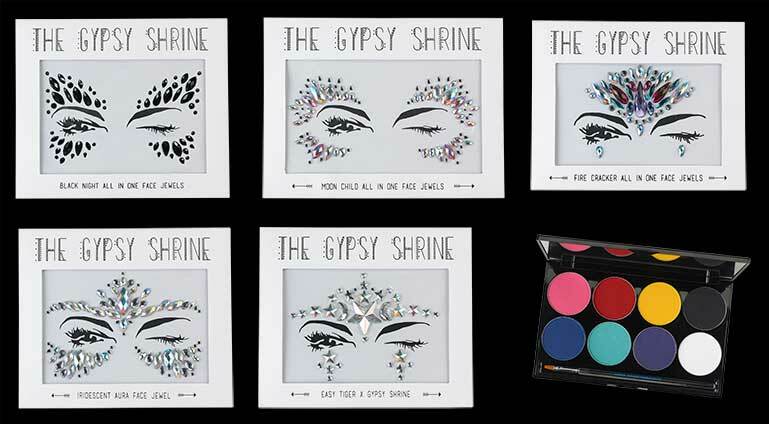 Click the button below to add the The Gypsy Shrine Face & Body Makeup Palette With Jewel Set to your wish list.